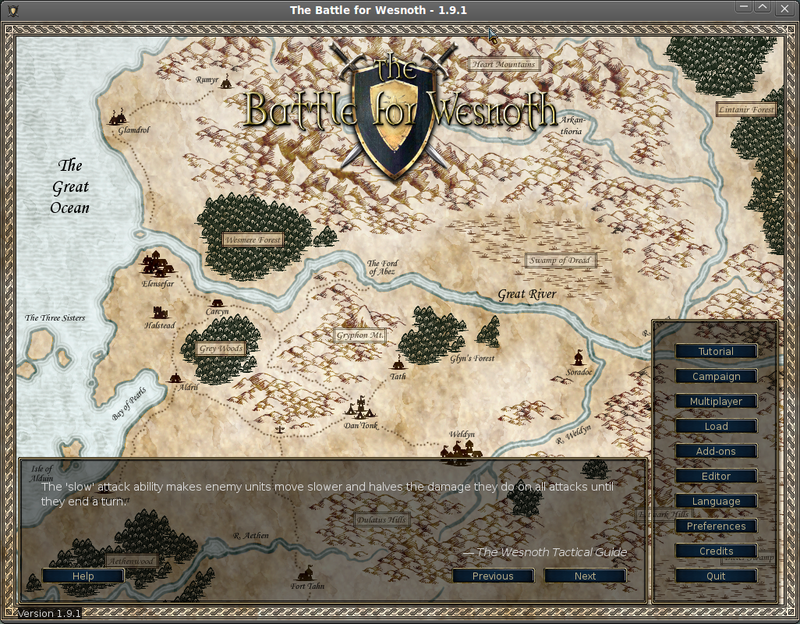 There is no question Battle for Wesnoth is the most played turn-based strategy game on the Linux platform, being probably the most polished, full-featured and addictive game in its category. In this article I will talk about development release 1.9, plans for the upcoming 2.0 release and the brand new features offered at the time of writing. For users who will want to try this game for the first time, keep in mind that the version reviewed here is a development version, that means it will be buggy and incomplete, with a lot of features stripped down or not working. Try the stable, 1.8.4 version instead. 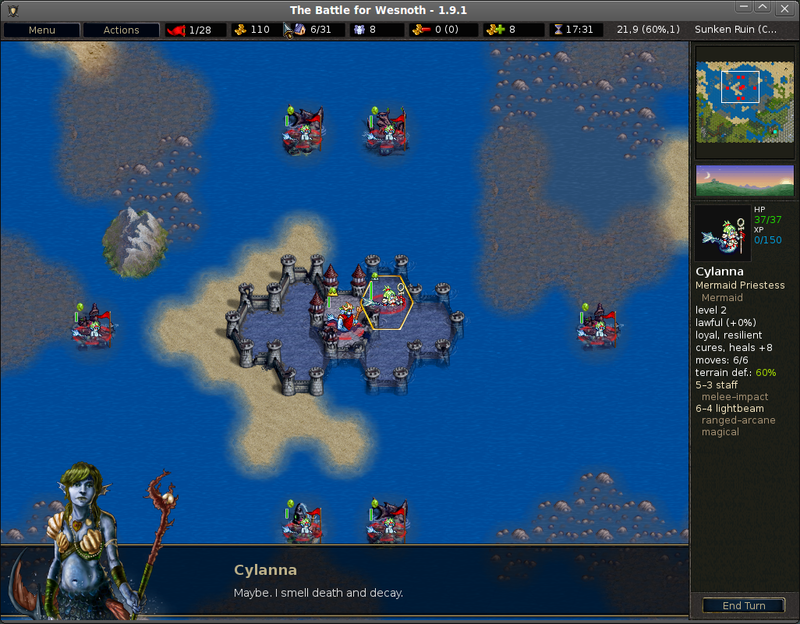 Battle for Wesnoth gained a great deal of popularity due to many factors: it has great single player and multiplayer support (including campaigns, skirmish games vs AI for SP and online or hot seat modes for multi player), great 2D unit graphics and portraits, a gamestyle which borrows a lot of good concepts from other games, but also brings in new ideas, powerful community which contributes greatly to improving and writing various add-ons. There are also countless other features Wesnoth provides: background music licensed under a free license, support for many languages, possibility to create new maps, units, game modes, eras, terrains etc using WML (the Wesnoth Markup Language - which, by the way, is pretty easy to use and learn), configurable hotkeys, and it can be run in fullscreen or windowed mode. 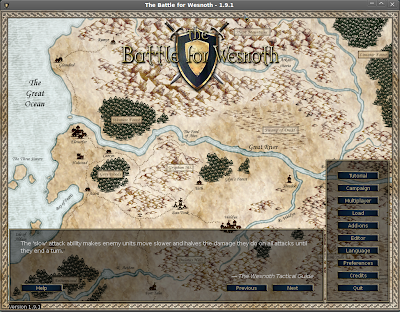 In the past I have reviewed Wesnoth 1.6, and in the mean time a new stable version was released, 1.8, which also brought new campaigns and many other improvements, especially at the lobby, general game speed and unit portraits. However, the release I'm going to talk about is development release 1.9.1, which was uploaded to SourceForge just a few days ago. 1.9 sounds very promising, especially since it will turn into Wesnoth 2.0 once it gets full-featured and stable. Currently, only a few new features are visible, like the selection hexagon which looks very neat now compared to the one in previous versions, which used a terrain-highlight style. Also, the graphical cursor is now enabled by default. Another nice change can be observed in the several new terrains, which are more polished and blend better one in another. The networking code has been completely rewritten, which is finally great news, because there were always connection issues in the past versions, especially with client disconnects. Also, a new campaign is available, called 'Dead Water' and including 13 merfolk intermediate scenarios. Another thing about campaigns: the story at the beginning of each campaign includes now Back and Forward buttons, alongside the classic Skip button. This is surely useful if you missed some part and want to read it again. I'm going to talk a little about a new, very useful feature: the planning mode. Codenamed 'Whiteboard', the planning mode was developed as a GSoC 2010 project and allows you to test visually possible moves, including recruiting, attacking and recalling and check the best enemy moves for the new layout. This let's you see 'what would happen if I'd do this'. To enable the planning mode, use Shift+P or go to Actions and tick the Toggle planning mode option. To execute the planning mode, press X, to delete it, press H, and to reorder actions use PG_UP/PG_DOWN. Considering it is still in a testing phase and there is more to add until released, I won't talk about bugs or other technical problems found. However, I'll mention here just one drawback: Wesnoth 1.9 is very slow at the moment, but hopefully this will get improved with time. What can I say in the end? I'm a dedicated Wesnoth user and I can't wait until this turns out into a brand new and stable 2.0 release. You failed to mention your Wesnoth nick. Maybe we should do battle? Sure, I'm there pretty often lately, behind the nickname Chris7mas. I haven't noticed any serious bugs with the Wesnoth 1.9.1 release, so I disagree on that, otherwise it's a very good game! As a matter of fact I'm not sure. I've read the link below before, not once, and it's not up to me to decide the next version number, since I'm no developer. Did they decide yet whether it's going to be 2.0 or 1.1? Nice review, makes me look forward to the next stable release. You did gloss over one of (what I feel is) Wesnoth's great strengths, though. Not merely 'background music', Wesnoth's epically cinematic orchestral score really helps sets the atmosphere for the game and is a big positive for my playing experiences.